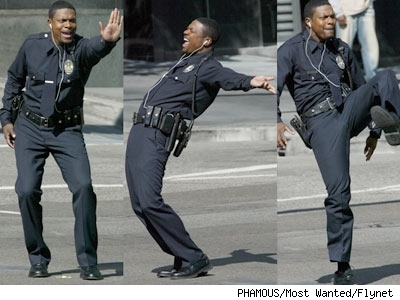 JuiicyScoop: Chris Tucker on set of "Rush Hour 3"
CHRIS Tucker showed off his Michael Jackson impressions and sang for the cast and extras waiting each night between takes for "Rush Hour 3" at L.A.'s Galaxy Theater. His Micheal Jackson impressions are sooo tired, where's the Smokey impressions? Speaking of Smokey, Chris Tucker is making a cool $25 mil from the movie, I don't think all 3 Fridays could have paid him that much. No doubt he's weird, but I just loves his work. It's amazing that Chris Tucker has been in maybe five movies total, yet he's making 25mil. There are many established actors who aren't making that much, go Chris.